So The Average Office Chair Won't Cut It? Here's 5 High Tech Solutions! We're all on a mission to get comfortable in the workplace. If the average office chair just won't get the job done, you're in the right place. Today we're highlighting 5 super advanced "smart chairs" that take the guess work out of office ergonomics. These auto responding chairs make it easier than ever to achieve the perfect sit. Prepare to be impressed! 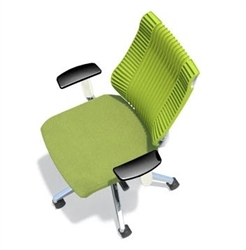 Allow us to introduce the RFM Preferred Seating Verte chair. Nearly a decade in the making, the 22011 Verte executive chair is truly a cut above the rest. Designed by industry leading ergonomists and healthcare professionals, the Verte chair features 11 torsion springs that work together to mimic the human vertebrae when sitting naturally. If you can't get comfy in this chair, you're better off working standing up. Up next is the Living chair. If you had a chance to visit the NeoCon show in 2016, you likely saw the huge crowds surrounding this auto responding modern office chair from Mayline. Priced at $405.99, it's one of the best smart chair buys on the market today. The Living chair features a weight activated passive seat slider mechanism that provides constant support as you operate naturally. The T shaped arms are a nice touch that do require a little adjusting, but will have you computing at correct angles in no time. Global's office chairs are always ahead of the curve. While competitors are hard at work looking for ways to keep up with the latest ergonomic trends, Global is hard at work setting them in motion. 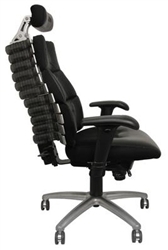 Take one sit in their 6670-2 model Arti flexible back office chair and you'll quickly see what we mean. The back of this advanced task chair articulates like the spine and instantly reshapes itself to the user's profile. If you're not feeling the modern open back look, Arti chairs are also available in mesh and fully upholstered variations. Features, on features, on features! 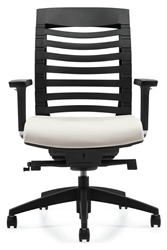 The iOO chair from Eurotech Seating is an ergonomic marvel. This cutting edge swiveler comes packed with independently adjustable components that really come in handy during those tough days at the office. Eurotech says the iOO represents a pinnacle of evolution in the seating world. After testing it out, we couldn't agree more. This chair packs a major ergonomic punch. 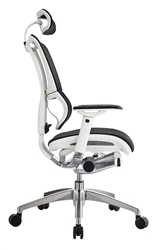 We wanted to end today's post by highlighting an advanced office chair for big and tall users. Sadly, there's not a lot of options out there on the market. That said, it's nice to know brands like OFM have our backs. Literally! Their all new Stratus chair is a breath of fresh air in a world filled with lack luster big and tall seating solutions. With it's heavy duty mechanism, the 257 model Stratus chair is ready, willing, and able to accommodate users up to 350 pounds. The Stratus comes fully loaded with adjustable arms, a multi functional control mechanism that's easy to operate, and extra wide padded seat. At $300.99, you'll be hard pressed to find a more well rounded big and tall mesh back office chair in 2017. While not an auto responder like the other chairs highlighted here today, it's still incredibly advanced, stylish, and excels in intensive work environments.